I’m continuing to provide my observation for upcoming Microsoft Office 2010 version. Today, I’d like to discuss two features related to Office 2010 that probably not on the surface of day-to-day communication, but at the same time will be very important in context of broad PLM implementations. In Office 2010 Command replaces previously – command and, known from Office 2007command. The new concept of Backstage, going to be introduced in Office 2010 will centralize and summarize access to general information about documents and will simplify way to communicate with content in my view. In addition, <Share> command takes central place in User interface. <Share> command provides central place where exchange between Office and other formats and systems will happen. This is very interesting move. Microsoft reasonable assumes <Share> command will provide better feeling to users and will eliminate information redundancy. For me, this place will become central place to integrate with PLM system in Office 2010. Another important topic in my view. Open Document format was introduced in Office 2007. It provides an alternative XML format for saving documents and content. 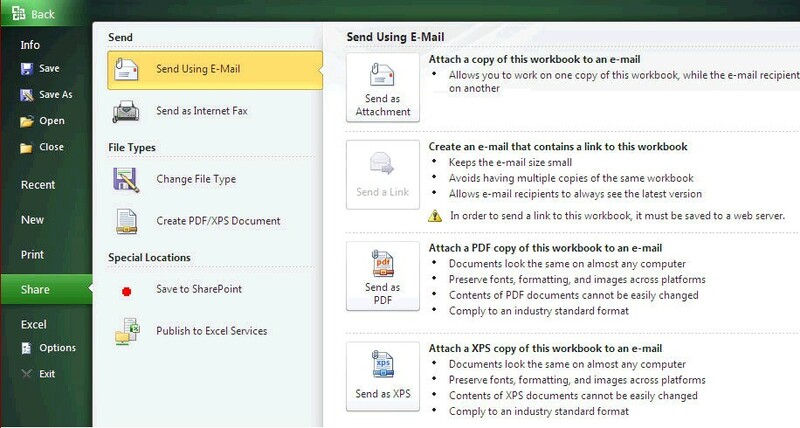 In my view, Open Documents format played important role in the past when Office 2007 was integrated with MOSS 2007. So, together with command, Open Document format provides good foundation to integrate unstructured content with Office in very granular way. What is my conclusion? 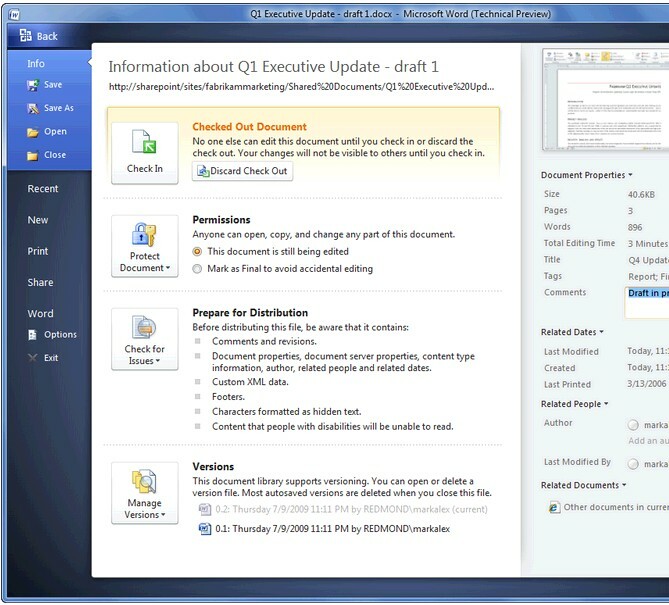 Properties, Share, Change File Type commands and combination with Open Document Format in Office 2010, provides advanced foundation for integration with PLM content and systems. They will allow to integrate non-structured content in PLM such as – Requirements, Engineering Change, Published 3D content etc. Interesting stuff. However, of the 30+ companies I consult to, 99.9% of them are still using Office 2003 and don’t want to spend the $$ to try Office 2007 let alone Office 2010. I don’t know anyone that says “I can’t wait to spend $300.00 to try Office 2007”, do you? I did not know that. So, I have Office 2003, I can now use Office 2010 (web) for free? Yes, Office 2010 Web product will be free. Similar to Google Apps. -Oleg. OK, thanks, I’ll check it out some more. Good post, Oleg. I am not sure about the value of “Backstage” yet as I haven’t seen a lot of details on it. Perhaps it could be useful, or perhaps it is just a way to aggregate commands in a more logical way for users. We’ll see over time, I suppose. I do think that the “Share” command you mentioned is significant though, even if only in what it indicates about Microsoft’s philosophy. I believe it indicates a shift in thinking such that all files exist in a context and that the context can be as important as the content (therefore sharing content is integral to the content creation experience). As a consultant, I see the evolving XML file format standards of ODF as a great thing. This will make content much more dynamic and easy to move between systems and applications fluidly. One of the original promises of XML-enabled databases was that reports would just “drop out” and be formatted using an XSLT to create beautiful documents. ODF is a step toward that in my view, and will help us view system content (like PLM data) in more natural ways (spreadsheets, documents, presentations). Jonathan, thanks for comment! Everything I wrote, in my view, is mostly about philosophy. I didn’t have chance to touch Office 2010 yet. I suppose this is as a significant move forward. And… great applause to Google. We can see great advantages of competition. Regards, Oleg.